Still delivers the series' sandbox mayhem, but is underserved by some pretty dated systems. It's an improvement on the last game but as a franchise Just Cause is still squandering the majority of its potential with its banal mission design and dull storytelling. Traversal and destruction highlight Just Cause 4 and new gadgets add a welcome layer to the formula, but missions rarely bring out the game's best features. Solis is a huge island, which allows for a realistic distribution of targets, and environmental diversity. There's some pleasure to be had exploring its various environs of city, jungle, mountain and beach-fronts, making use of an almost infinite variety of vehicles. There are times when Just Cause 4 is amazing, but the final result is a game that loses parts of what made Just Cause great in the first place. The new mission structure repetitive and causes the series' staple destruction to take a backseat. The tether customization is top notch and the new weapons are a winner, but things like throwable C4 are gone. And the extreme weather, which is exciting when it appears, doesn't make its presence felt during most of the game. I had fun with Just Cause 4, but it's a game I want to love more than I actually do. Temper your expectations. Just Cause 4 is not a better game than its predecessor. In many ways, it feels like the same game, just with a new continent to explore. For some, this may be all they ever wanted, but for the rest of us, it's just not enough. The formula starts to show itself early and can feel monotonous only a few hours in. There will always be joy in the mass destruction of the Just Cause 4 games, but the games seem to rely more and more on "making your own fun" instead of pushing the player into exciting and unique scenarios via the mission structure and overall game design. But the game also lets you become Michael Bay by giving you total control over the chaos you can create on the screen. That may not be a flattering comparison in the cinematic world but for a game like Just Cause 4, it’s one of the highest compliments. Just Cause 4 feels old in its mechanics, but it is incredibly fun to play. The extreme climate effects, the hook, the parachute and the flying suit allow us to develop some crazy combat maneuvers. Beyond the occasional crashes and the visual flicker, the game ran fairly well with so many things happening on screen. I never noticed any significant slowdown, even with the game’s weaponized weather completely upending the area around me. At worst, there’s a slight framerate dip with massive rapid explosions, but nothing that impacted my gameplay experience. 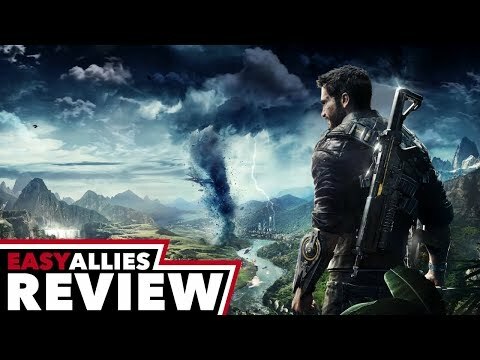 Overall, Just Cause 4 is a very entertaining package and its potential won’t be fully tapped for a long time. Just Cause 4 is a success at the same things that made great the third game, but a failure when tries to improve its narrative, variety o polish. Finally a fun game in short bursts but not much else. In Just Cause 4 you will have fun making things explode and exploring the map in the most different ways, but don't expect a great depth of play. Just Cause 4 more often than not feels like an average open world third person shooter than it does the explosion filled bonanza that it should be.